Unless you opt-out of leak protection, you will be charged. The other two are optional, great for older neighborhoods, not so much for newer ones. This is on the consent agenda, since it’s been discussed twice I don’t see anyone pulling it for discussion. The only other item on the agenda is a Public Hearing pertaining to use of Community Development Block Grants Funds (CDBG) followed by discussion of updating the Citizens Participation Plan. Normal recently had the same required public hearing. We need to have a discussion! We pay taxes to Washington DC. After the bureaucracy eats part of it for federal salaries and benefits, some of the money is returned to cities across the country. The cities eat up more money for salaries and benefits deciding how to spend their DC windfall. Next the money is doled out to organizations like Mid Central Community Action where even more goes to salaries and benefits before finally reaching the people it was meant to help. The final recipients are kept poor because they won’t qualify for help if their incomes rise above whatever dollar amount is set. This redistribution of wealth is not helping people, it creates a permanent underclass and voting block while claiming compassion. That is more than $1.5 million that helped nobody but employees. It gets worse. Matt Drat joined MCCA in August of 2016. His bio shows working at the BCPA for 10 months from 2015-2016 and a little over a year in 2012 and 2013. He worked for Home Sweet Home Mission from 2013 – 2015. When he left there, he sold cars at Brad Barker Honda for 6 months. Block grant money isn’t only received from the Department of Housing and Urban Development, cities also get Community Services Block Grants from the Department of Health and Human Services. Matt Drat of course wants more federal money. Months ago I FOIA’d emails when I heard some rumors. 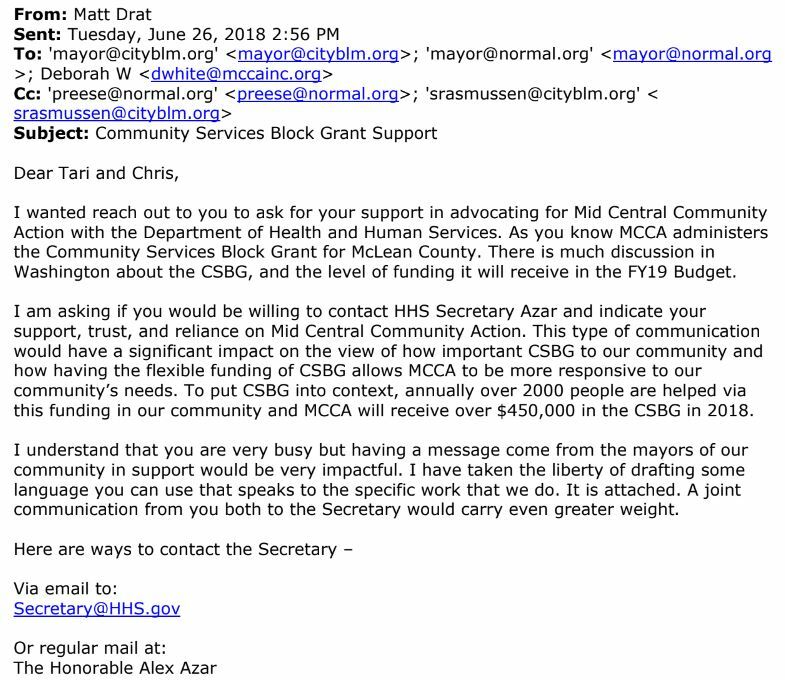 Matt got Tari Renner and Chris Koos to contact HHS on his behalf for even more federal money. I’m sure he didn’t have to ask twice. 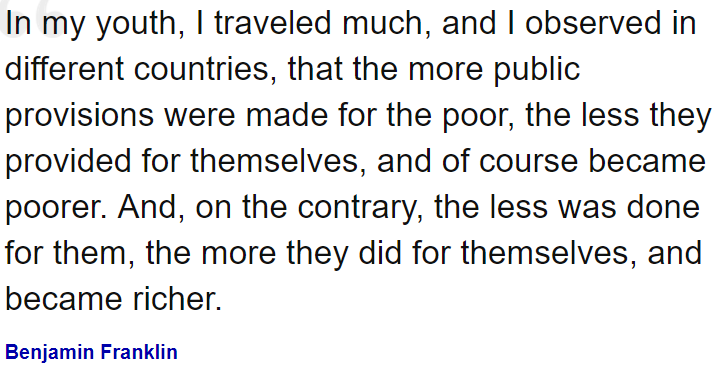 The Federal government was not created to redistribute wealth while feeding its employees. America is self-destructing from within because a network of “takers” has been created to demand money while claiming to be compassionate. Don’t forget Connect Transit always has their hand out too. Citizens need to realize government at ALL levels must be limited. With close to 50% of voters wanting free stuff, that’s not going to happen. Government doesn’t create anything, it only takes what you work hard for. Big government prevents prosperity! Posted in BloNo, Bloomington, BLOOMINGTON CITY COUNCIL, Constitution, elections, Koos, Liberal Media, Local, Normal, pensions, Progressives, Renner, Taxes.Tagged Gift cards, government grants, Green Top, Limited Government, Matt Drat, MCCA, Mid Central Community Action, sick leave buy back, SLBB. Maybe we ALL should get “yellow coats” and join a very popular movement at the present time, whose MAIN argument is that BIG government/money IS OUT OF TOUCH with the lower classes!! Sadly, Koos and Renner would love a big fossil fuel tax to “save the environment” and help their chums over at Rivian. What are the chances Trump cut subsidies for electric vehicles? It’s amazing how much work Koos and Renner will do, without hesitation, when it involves taking taxpayer money. Imagine if they applied that level of effort to getting out of the way and not micromanaging the business community and economic development. The MCCA is full of lefty loonies, so that was a must-do for Koos and Renner. Gotta keep the non-profit industrial complex going. How can these people sleep at night? Theft, pure and simple. Did you see what account it was charged to? Suspense. A slush fund. Stan: VAMPIRES don’t sleep at night! AGREED, that IF Koos AND Renner put their efforts toward the GOOD of the city, and NOT what they believe is best for the communities, the twin cities would be SO MUCH better off! It’s almost as if when ONE of the 2 does something dumb, the other HAS to top it! Lovely! Tami Foley Head of compliance and Human Resources told me that the CSBG wasn’t tax funded. She also stated Tari Renner was a funder. I’ll have to find the e-mail I have where she back pedals and admits Tari isn’t a funder. 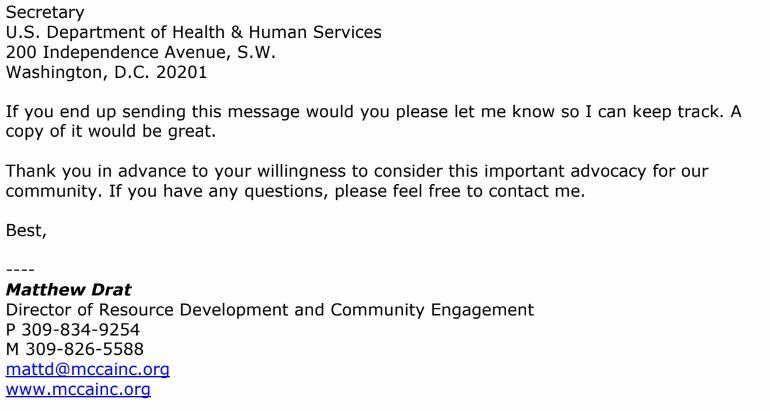 It’s sad when the head of compliance doesn’t realize HUD IS FUNDED WITH TAX DOLLARS. I have to wonder what her salary is. Seems likes Matt Dratt might have a conflict of interest when he uses the BCPA FOR THE FUNDRAISER “Seeds of Change” that likely lost money. When you see “seeds” and “change” in the same little packet of words you just know it has socialism and redistribution stamped all over it.